The only high-quality raw material is used for preparing the offered lot and we make sure that it is sourced from the trusted places and that too after complete quality confirmation. We can carry out excellent supply chain management, as we have an ultra modern warehouse and the latest inventory control systems. Both help us meet bulk requirements and save us from stock out situations. 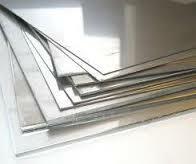 Our stainless steel sheets have a mirror finish on the surface with superior corrosion, water, chemical, and heat resistance.